You know how I've been saying I feel so much bigger with this pregnancy? That I've been showing earlier and popping out more and, in general, needing maternity clothes since the first trimester? Here's a picture of me at 20 weeks this time. And here's a picture of me at 20 weeks with Teyla. I really must have done something in the last two years to offend my abdominal muscles. Or maybe they are just union workers. "Sorry lady. It's our break. We'll catch you after the holiday." 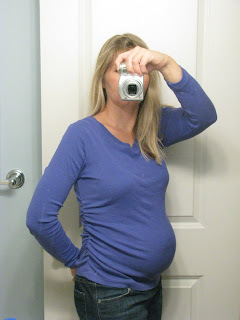 I wrote more about being 20 weeks pregnant -- halfway! -- at 5 Minutes for Parenting today. See you there. Impressive! I've heard subsequent pregnancies do that to you... but Teyla wasn't you first so that doesn't really apply. Let me know what kind of compromise you are able to reach with the ab union. Mine have been on strike for 6 mo. now. And yes - later pregnancies show SHOCKINGLY earlier. With my third, I think I started wearing maternity pants three seconds after the test came back positive. SO CUTE!! I love pregnant bellies. I've only been pg twice, but the first time I hardly showed till 7 months, and the second I was showing at about 1 1/2 months. Seriously! When I was 7 months, people in the grocery store would say, "Gonna have that baby any day now!" and I would grit my teeth (I was intensely irritated for several months there) and say "No it's TWINS." and they'd say, every single time, "Twins? You're not very big for twins!" Grrrrr. You look GREAT! :) Just right for 20 weeks with a boy! Yeah, it's normal to show more and faster, but remember outfits vary too. I've seen women wear one outfit and barely look pregnant, and the next day a different one makes her look past due! It's like our bodies go, "Oh yeah, I've done this before, I remember!" and it's so much easier for everything to *pop out* where it already knows it's headed...But also, did you concider that Teyla is a girl, and this baby is a boy? Before I had babies, I didn't believe that the gender of the baby would make a difference in how I carried, but I can tell you, after 2 boys and 2 girls, I am convinced I carried the girls more all around, the boys straight out like a ball. This was the first thing I thought when I saw the pictures of you. Looks like this boy is just a ball right in front, looks like Teyla girl was more all around, but not as much pushing right out. Like I said, I would not believe this theory if I had not lived it out myself!! In any case, you look tiny and cute in both pictures, and should give yourself a high five-you still look tiny to me. Woohoo, 20 weeks! But don't go getting in a rush- we need to get home first!!! And you look so adorable pregnant! BTW, loved your comment on the Zzzz post : ) Made me miss you more! Missing you all so much- hug everyone for us, please!!! Girlfriend, I knew it was a fact even without the pics! Four kids in less than six years, believe me, will do it to you. Something about less muscle resistance. Or, something. You're beautiful on both shots! YOU LOOK SO STINKIN CUTE!!!! However, I may have some sad news for you. Two words that I know way too well. Diastasis recti. Me TOO! I am 17 wks along now and I think my belly is about the same size as yours. I did not show this fast with #1, I do think its because our body knows the process and just like in your 5min post, all the familiar aches and pains have started up early...umm hello hips aching?!?! This is just crazy. And with #1 I was ok with the whole waiting game. I think I am more impatient with #2 because I know what I have to look forward to...there are fewer secrets for us repeat moms. Aw, you're still adorable! I am WAY bigger this time than I was last, but everyone tells me it's normal. I've gained only a couple pounds more, but my belly is way out there. You should be a maternity clothes model---what a perfect, round, happy belly.